Adapted by Janine Hasey, UCCE Farm Advisor, Sutter/Yuba/Colusa Counties; Greg Browne, USDA Plant Pathologist, UC Davis; Astrid Volder, Plant Sciences, UC Davis; and Bruce Lampinen, UCCE Walnut Specialist, UC Davis. 2017 brought us unprecedented high and fluctuating water flows in the Sacramento and Feather Rivers, damaging orchards from direct flooding and indirectly via under-levee seepage. Many trees had a long exposure to waterlogged conditions through the winter and spring. This season we expect to see effects from last year’s flooding in several orchards. This article discusses strategies for minimizing losses in 2018 in flood-impacted orchards. Please also read our previous flood articles written throughout 2017, as well as 2017 research results. We advocate a “wait and see” approach, keeping trees as long as they are economically productive. Trees girdled or nearly girdled with Phytophthora may not survive, but some scion cankers may stop or “die out” in heat. In previous research, phosphonate (also known as phosphite) treatments were found to suppress canker expansion caused by Phytophthora citricola. 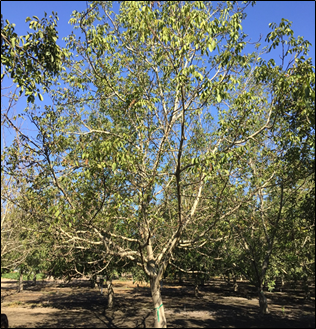 It is advisable to replace trees killed by Phytophthora with clonal Paradox RX1 rootstock, which offers resistance to the pathogen. Consider topping trees with vigorous shoot growth on lower limbs. 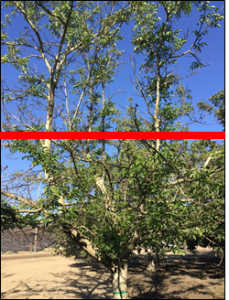 From grower experience, these trees often recover by producing new shoot growth and it’s usually obvious within the season if a topped tree will respond and grow or not (Photo 1). In contrast, trees that have very little new shoot growth (Photo 2) often don’t survive the season after flooding so topping is unlikely to promote tree survival. Photo 1. Top or head this tree where indicated by the red line. Photo: J. Hasey. Photo 2. Topping or heading this tree is unlikely to help in tree survival. Photo: J. Hasey. In many cases, root growth may still be rebounding from root death last season. Keep in mind that flooded orchards are likely dealing with a shallower, less developed root system than in previous years. Capillary rise is the process by which water moves into soil above a water table resulting in soil in this zone being above field capacity. In medium loam to fine clay, expect approximately 3 feet of capillary rise. The finer the soil texture the farther up water can move by capillary rise but the slower the rate of movement. It is easy to saturate the soil, particularly when the water table is close, so irrigate judiciously, ideally using both soil moisture monitoring and plant pressure chamber data to aid in determining irrigation duration and frequency. Water management in such settings is very difficult. Carefully monitor soil water levels using Watermark® or other soil moisture sensors installed at different depths. Soil-based monitoring will let you know the level where the soil is saturated as the water level drops, as well as the amount of water that is being moved up above this level of saturation by capillary rise. When using pressure chamber measurements, do not irrigate until trees are at least 2-3 bars below the fully watered baseline (more dry) and only irrigate enough to bring the trees back up to about 1 to 1.5 bars below the baseline. Be aware that pressure chamber measurements may not be appropriate where roots have been compromised, as the observed water stress in the tree may be the result of the inability of the root system to take up water rather than low water availability in the soil. Irrigating under those conditions would only serve to compromise the root system further. Where trees have been topped or have new shoot growth, apply nitrogen fertilizer in small amounts during May through early August when roots are active. Topped trees will have no crop until the following year so little nitrogen is being removed this season.